My garden is bursting with basil, so Caprese Bread and Pesto have been popular on our menu. I decided that Caprese Chicken would be a delicious dish made with garlic, Mozzarella, Tomatoes, Basil, Kalamata Olives with Balsamic Glaze! My family was OOH-ING and AAH-ING by the beautiful presentation. Hands down, the chicken is moist with flavors popping in your mouth, fantastic combo. Perfect served with a side of cheese ravioli and summer squash and a perfectly chilled bottle of Crisp Chardonnay. recipe note: Balsamic vinegar comes in many forms. I really recommend a higher quality one – it truly does make a difference. A low quality balsamic vinegar is very thin – like water. A higher quality one is slightly thicker (not as thick as balsamic glaze, but somewhere in the middle of the two). I have chosen to use a Balsamic Glaze for this recipe. 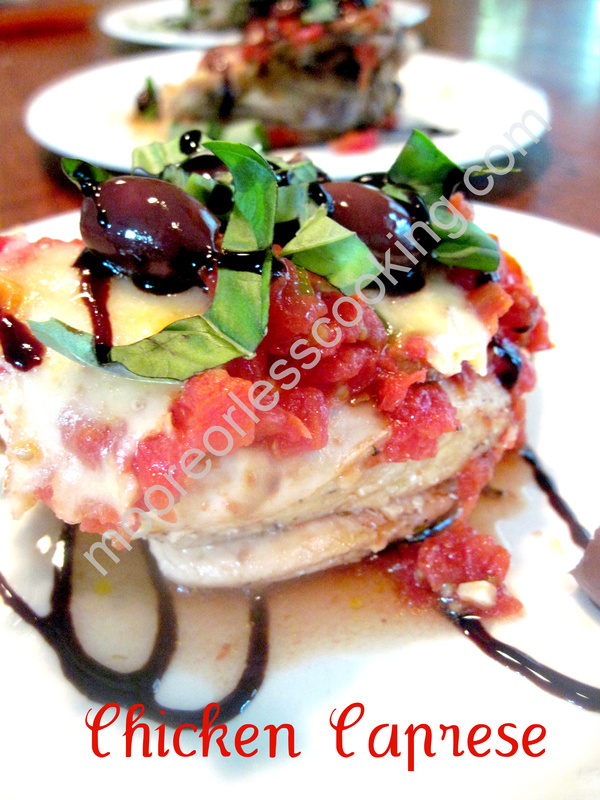 Delicious juicy chicken with Kalamata Olives, Tomatoes, fresh basil, melted mozzarella with Balsamic drizzled over it. In a large sauté pan over medium-high heat, warm 1 tablespoon olive oil. Add chicken, cover pan, and cook for about 10 minutes. Flip chicken breasts and continue cooking until the chicken is cooked thoroughly (or has reached an internal temp of 165°F). While chicken is cooking, in a medium sauté pan over medium-high heat, warm remaining 1 tablespoon olive oil. Add garlic and garlic scape,cook for about 1 minute, or until fragrant. Add tomatoes and continue sautéing until tomatoes skin starts to soften/wrinkle, about 5 minutes. Add canned tomatoes, warm for one minute, add olives, bring to a simmer. Remove from heat and stir in basil. Set aside. Once chicken has reached desired doneness, top the tops of each chicken breast with 2 slices of mozzarella. Pour tomato mixture on top. Place in a 350 degree oven until cheese has melted about 10 minutes. Lastly, drizzle plate with Mandarano Balsamic Glaze and Sauce and Drizzle over Chicken Breast. Hi Nettie. Wonderful presentation of the Chicken Caprese! I’m so glad you are a fan of our magic sauce – Mandarano Balsamic Glaze & Sauce!